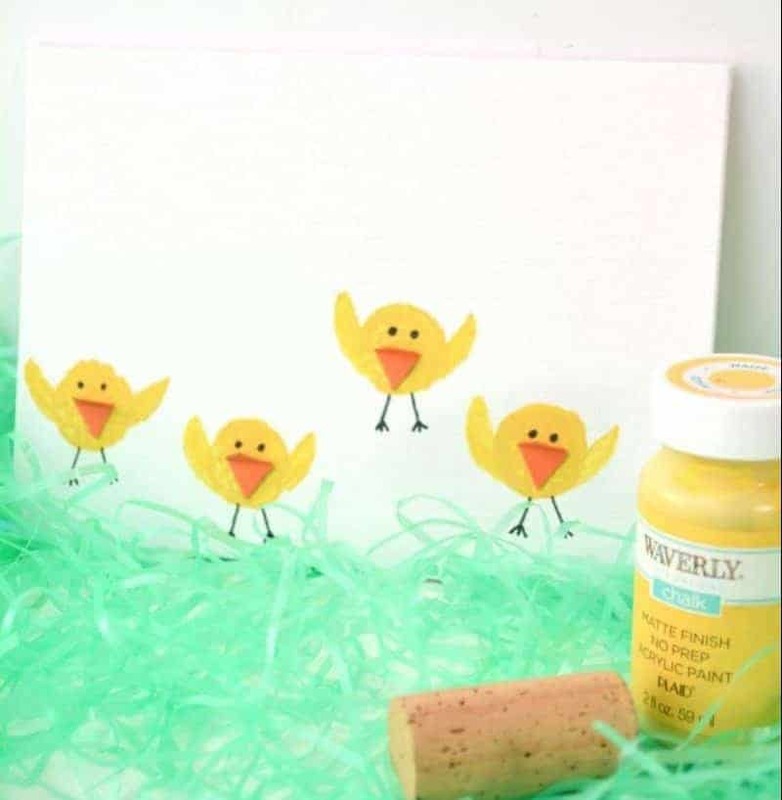 An adorable Easter chicks wine cork craft for kids, made by stamping paint with a wine cork. 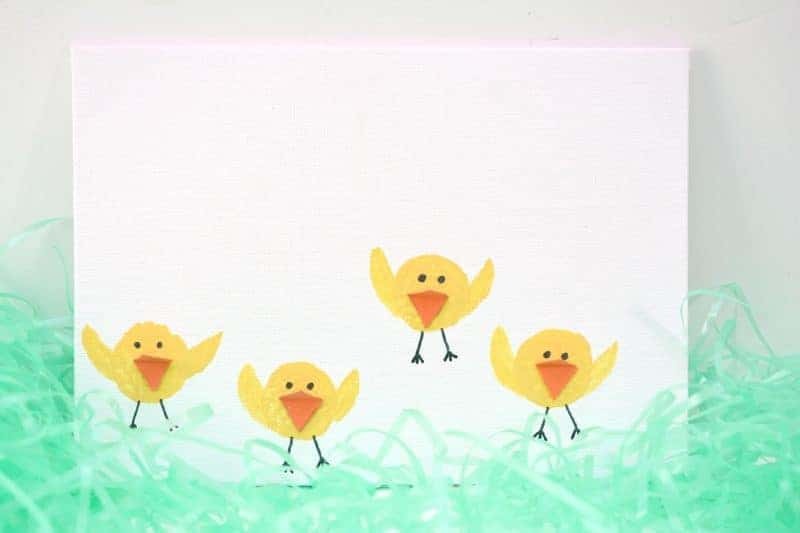 Not only is this Spring chicks craft fun, but it is something that will make a great DIY Easter decoration to display in the classroom or at home. 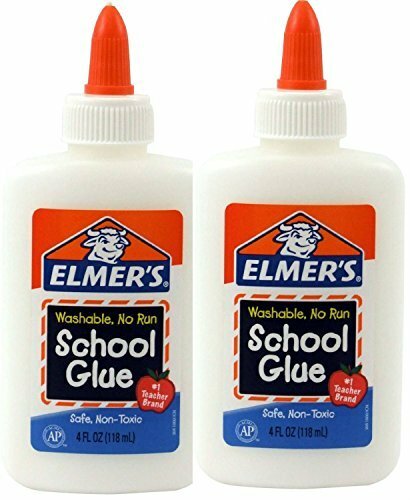 This is a great Easter craft idea because it allows for creativity and is something that takes a bit of time. The kids will love using the wine corks to make these cute little Easter chicks and you’ll love having the finished project to use as a decoration around the house or classroom throughout the Spring season. 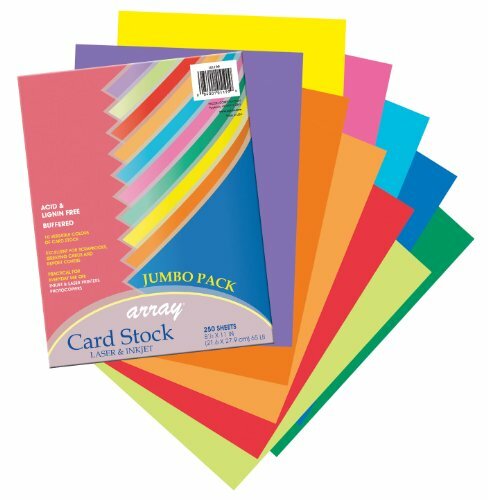 You could do the craft using construction paper, but I would suggest using cardstock or even a canvas if you would like the finished project to hold up better and stay in good enough condition to display year after year. 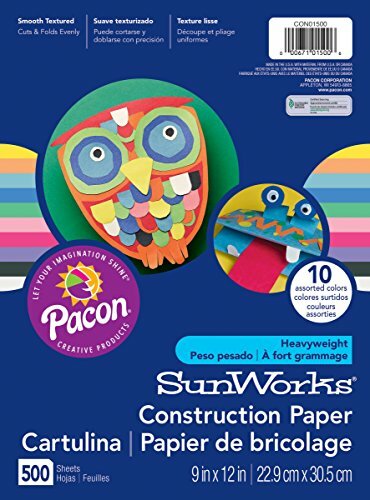 If you want something that kids of all ages could work on, this Easter chicks craft is a great choice. 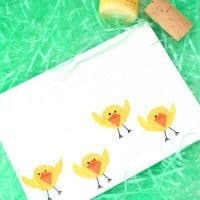 Younger children will need some assistance with the cutting and adding the details to the chicks, but they can still enjoy stamping those wine corks to make the chick's bodies. For every chick that you would like to make on the canvas, make a circle with the wine cork. Be sure to space out your circles so that you have room to make the rest of the chick’s bodies. 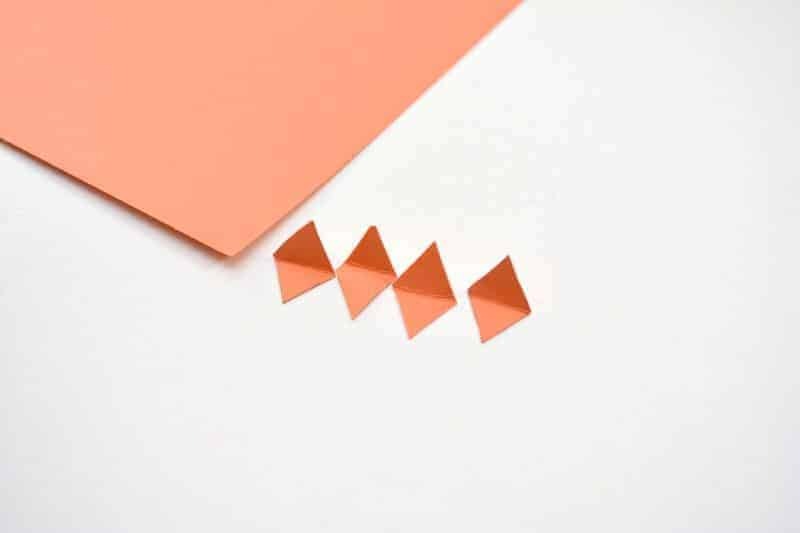 While the paint is drying, cut out small diamond shapes from the orange cardstock with scissors. Fold each diamond shape in half to form a beak. 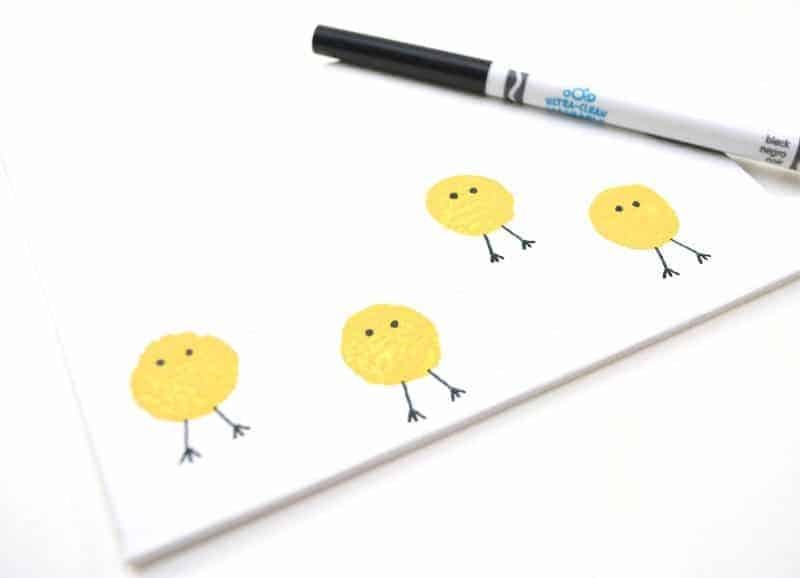 Make one beak for each chick you will have on your canvas. Once the paint has dried, draw on two eyes in each circle with a black marker. Then, add two legs with little feet coming out of the bottom of each stamped circle. Glue on a beak to the front of each wine cork circle, just below the eyes. 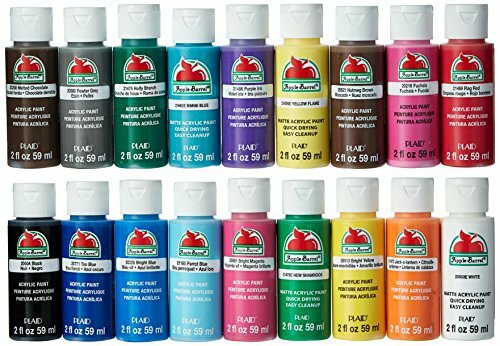 Allow paint and glue to dry before displaying your awesome Easter chicks decoration. 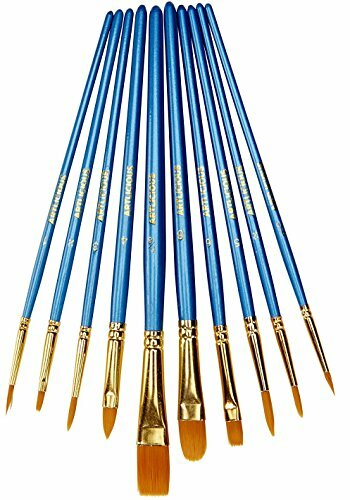 If you wanted, you could also make a canvas using brown paint to make chubby little bunnies. 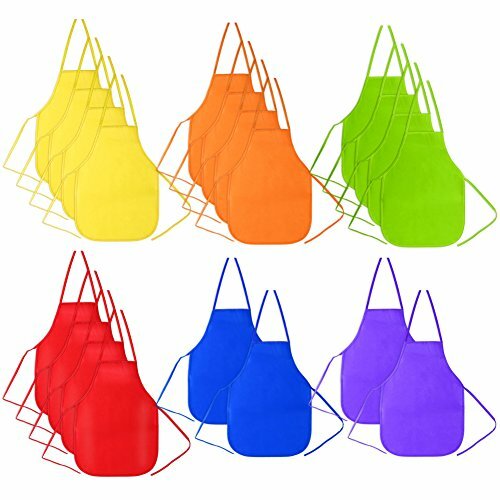 I think those would come out super cute as well. 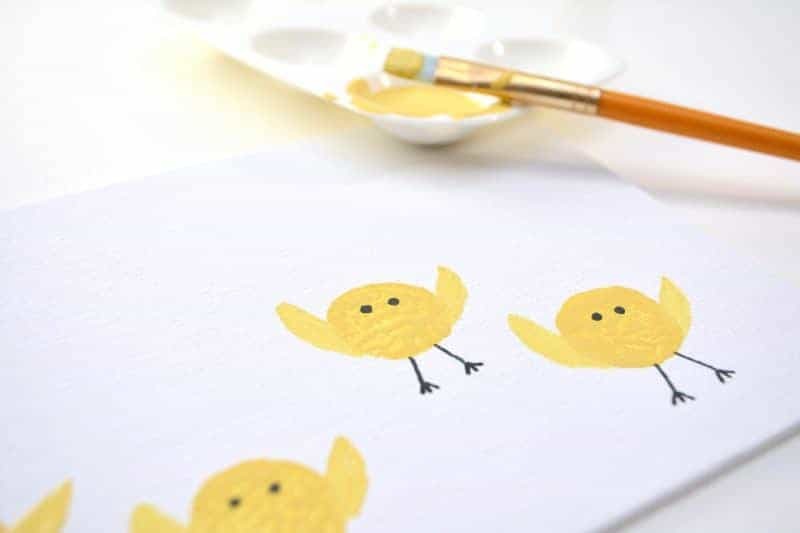 I hope that you enjoy this adorable and fun Easter chicks craft idea. If you decide to make it we would love to hear about it in the comments below! 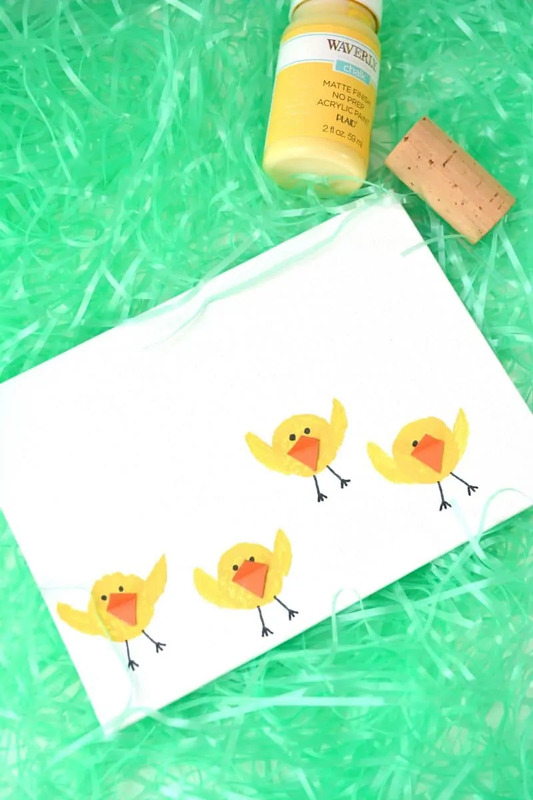 An adorable Easter chicks wine cork craft for kids, made by stamping wine corks. 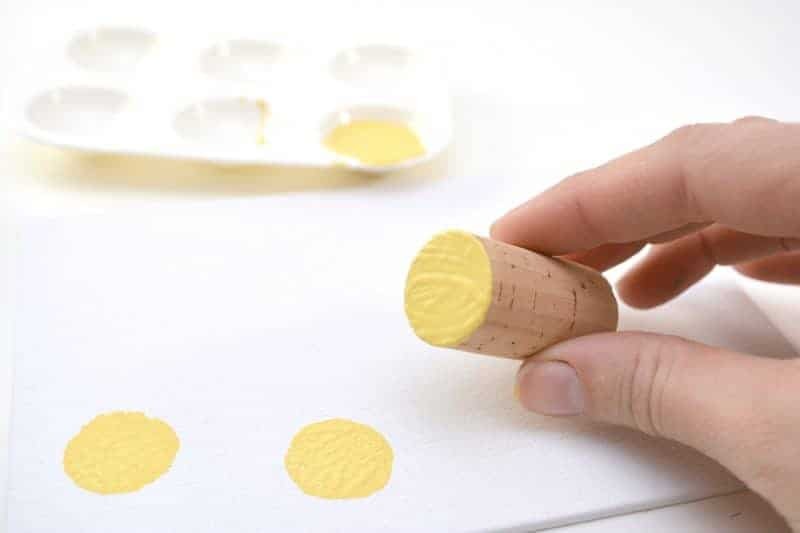 Dip cork into yellow paint. Dab off any excess paint on a paper towel, if necessary. 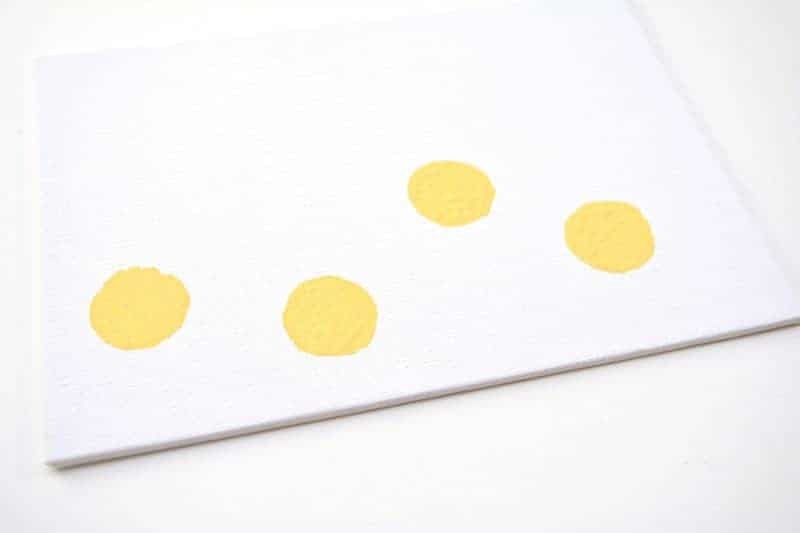 Use the cork to stamp circles onto the canvas. Space out the circles so that there will be room to add wings and feet later. 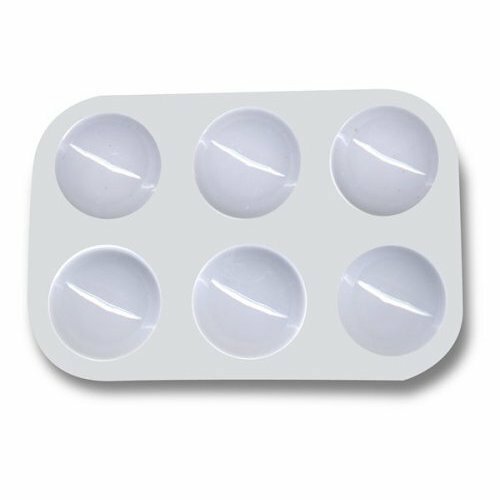 Once all circles have been stamped, set the canvas aside to dry. 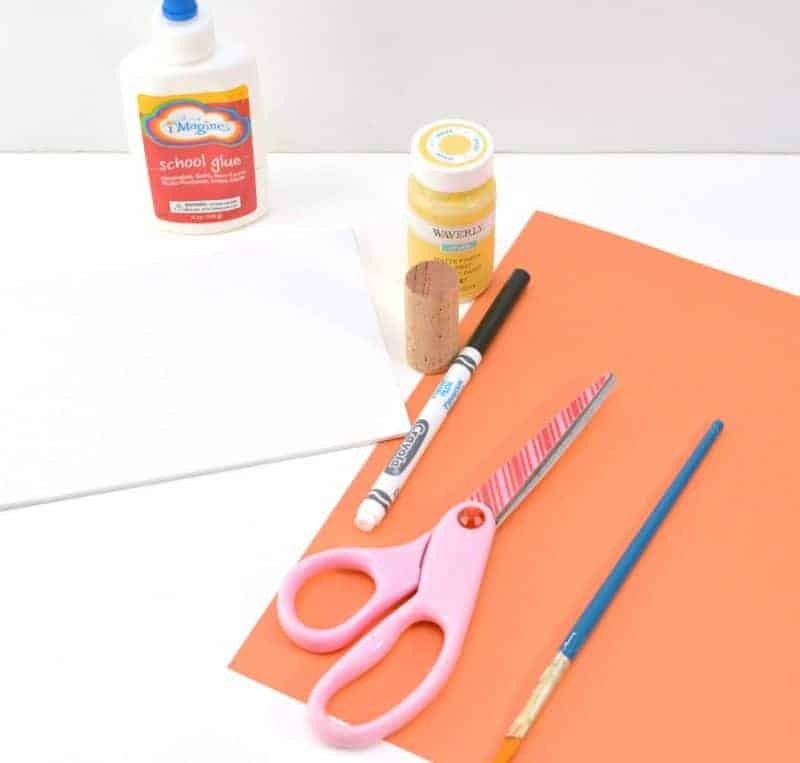 While drying, use scissors to cut out small diamond shapes out from the orange paper. Fold each diamond in half to form a beak. 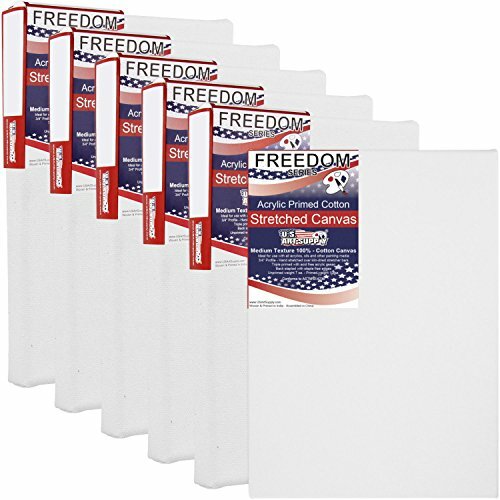 Make one beak for each circle on the canvas. Once the paint has fully dried, use a black marker to draw eyes, legs, and feet on each chick. Glue an orange paper beak on each chick, just below the eyes. Using a paintbrush and yellow paint, add wings to the side of each chick's body. 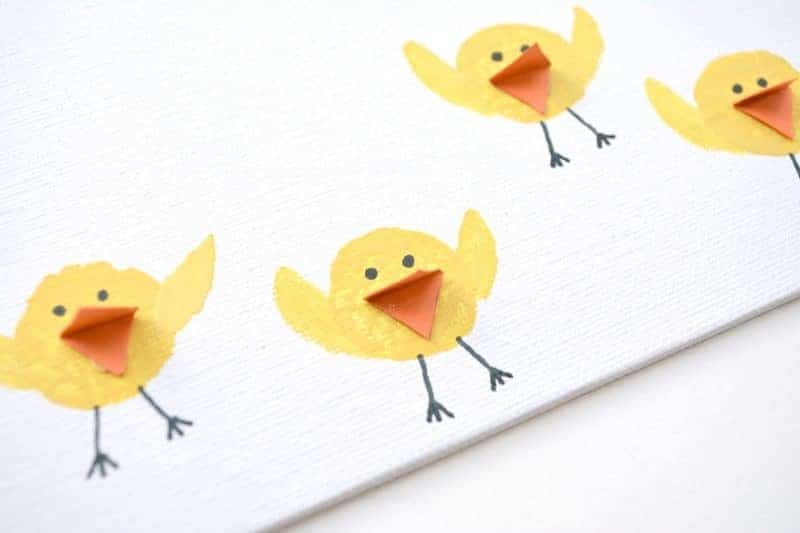 Allow paint and glue to dry fully before displaying your Easter chick canvas. This is a great craft. It’s easy,cute and really clever.